The dream of any homeowner is that of having a perfectly manicured and healthy lawn. Basically, the only way to achieve this result, if you’re not planning on hiring a lawn care professional, is with an outstanding lawn mower. On the market, there are hundreds of models of lawn mowers available, but a reliable and powerful mower that really stands out from the crowd is the Husqvarna 7021P. What makes this lawn mower special is the 160cc Honda engine, the compact design, and the competitive price tag. Read my Husqvarna 7021P lawn mower review to decide if this could be the right tool for you. What To Consider Before Buying a Gas Powered Lawn Mower? In a world that is becoming more and more environmentally-conscious, there are situations when an old-fashioned gas-powered tool represents a better choice. One of these situations is when choosing a lawn mower for a medium size lawn. Personally, I prefer using the gas-powered mowers for my lawn for the simple reason that they are more powerful and perform better on all the types of grass. In addition, the gas-powered mowers give me more freedom to move and more autonomy compared to their electric counterparts. Depending on the size of your lawn, you should choose a lawn mower with a more or less powerful engine. Typically, the gas-powered lawn mowers are equipped with engines that vary from 140cc to 190cc. The size of the cutting deck should be decided based on the size and topography of your lawn. For smaller lawns, an 18-inch cutting deck should be enough, while for a larger lawn you should choose a wider cutting deck of about 22 inches. The gas-powered lawn mowers are manufactured as push or self-propelled lawn mowers. The self-propelled ones are easier to handle, but in some cases, a push mower is a more appropriate choice. Equipped with a powerful 160cc Honda engine and featuring a 21-inch cutting deck, the Husqvarna 7021P lawn mower is perfect for medium to large size lawns and for all types of grass. The Honda CGV engine is not only powerful but also designed to be quieter compared to other similar engines. This will increase the comfort and you will also need to worry less about disturbing your neighbors. In addition to being quieter, the engine is also more lightweight than other engines, making the Husqvarna 7021P one of the most lightweight gas-powered lawn mowers in its class. With 4-horsepower, this mower is able to deal efficiently with any type and size of grass without losing speed or performance. A feature I really like is the stamped steel cutting blade that not only cuts efficiently through any type of grass but that needs very little maintenance if you clean the mower properly every time after finishing the work. The quality of the blade and the large width of the cutting deck mean that you will not have to overlap many times, which is a big plus. This lawn mower also features three grass discharge options, so you can choose to collect the grass in a bag, to discharge it on the ground or transform it into fine mulch to fertilize your lawn. Large wheels with double ball bearing. Difficult to adjust the cutting height. It is less performant while using the mulching plug. The Husqvarna 7021P is equipped with a 160cc Honda CGV engine with four stroke that provides 4 horsepower to the cutting deck. This power is sufficient to allow the mower to have an excellent performance regardless the type and size of the grass. In addition, the compact combustion chamber and the overhead cam are designed to reduce the fuel consumption and minimize the exhaust fumes. Designed with a single air filter, the engine needs very little maintenance. The only thing to pay attention to is the type of oil used. You should use only the type of oil specified by the manufacturer if you want to increase the lifespan of the engine. Unlike many other gas-powered mowers, the Husqvarna 7021P is really easy to start thanks to the patented Easy Start system. This system is designed to ensure an easy start every time the ignition cord is pulled, so you can forget about the frustrating starts typically associated with the gas-powered lawn mowers. Weighing less than 70 pounds, the Husqvarna 7021P is really easy to maneuver regardless the topography of the lawn. To increase the stability and the maneuverability of this lawn mower, Husqvarna equipped it with large and sturdy ball bearing wheels. The front wheels measure 8 inches, while the rear wheels 12 inches. The stamped steel cutting blade is sharp enough to cut with ease through any type of grass and can easily handle even the tall grass, so mowing will not be a problem regardless the condition of your lawn. The lawn mower also features an adjustable cutting height that ranges from 1.25 to 3.42 inches. However, adjusting the cutting height is a hassle, because you will have to adjust it separately for each wheel. The Husqvarna 7021P features the popular 3-in-1 discharge management system. You will be able not only to choose your favorite discharge option but also to easily switch from one option to another while you are mowing. To ensure the operator’s comfort, Husqvarna equipped the 7021P mower with an ergonomic adjustable handle. The handle is also completely foldable for easier transport and storage. With an excellent rating, this mower is considered valuable, durable and powerful. Several users define the Husqvarna 7021P as being excellent for lawns up to 1 acre, while the stability and performance on sloped and rough terrains are outstanding. However, it seems that there is a flaw in the warranty system because the mower comes with two different warranties, one from Honda for the engine and one from Husqvarna for the rest of the mower. For this reason, some users complained about the poor customer service and warranty issues. You can read more Husqvarna 7021P lawn mower reviews here. A versatile and more powerful lawn mower, suitable for all lawn sizes thanks to its self-propelling function, is the Honda HRX217K5VKA. However, all this comes with a salty price. The Honda HRX217K5VKA boasts a 190cc CGV engine, being much more powerful than the Husqvarna 7021P. More versatile, the Honda HRX217K5VKA will allow you to bag, mulch, and discharge the grass but also shred the leaves. It evens allow you to use a combination of mulch and bagging. Both mowers have 21-inch cutting decks. You can ﻿﻿find out more about the Honda HRX217K5VKA here. Less expensive but also less powerful, the Craftsman 37430 is an excellent alternative if you can’t afford the Husqvarna. 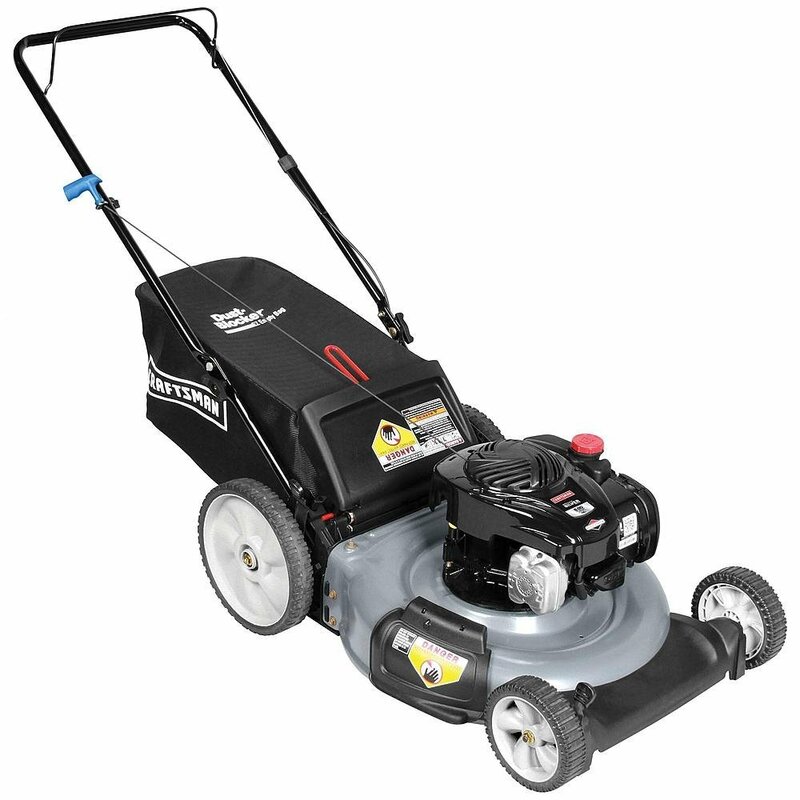 The Craftsman 37430 has a 140cc Briggs and Stratton engine that has lower performances on thick or high grass compared to the Husqvarna 7021P. Both mowers have a 21-inch cutting deck and a 3-in-1 cutting feature. The Craftsman’s wheels are slightly smaller compared to the wheels of the Husqvarna, measuring 7 and 11 inches. You can find out more about the Craftsman 37430 here. Another popular push gas-powered mowers in the 21-inch cutting deck class is the Yard Machines. Equipped with a Powermore 140cc engine, this mower is reliable and lightweight. Due to the smaller engine, the performances of this mower are slightly lower than the Husqvarna’s. The Yard Machines is less expensive compared to the Husqvarna 7021P. The cutting width is the same for both mowers. You can find out more about the Yard Machines Push Mower here. As this Husqvarna 7021P lawn mower review shows, despite having some minor flaws, this lawn mower represents an excellent choice if you’re searching for a powerful walk-behind push mower. What I really like about this lawn mower is the increased maneuverability on any type of terrain given by the large and sturdy wheels and the great power provided to the blade that enables me to mow my lawn quickly and efficiently. It’s true, it is rather annoying to adjust the cutting height for each wheel, and it would have been great if the mower would have been equipped with a blade brake clutch. Nevertheless, this is still one of the most lightweight and reliable lawn mowers in its class, and it comes at a more than affordable price. For these reasons, the Husqvarna 7021P is highly recommended. Find out more about the features and price here.